Holiday decorating safety tips for your home to keep in mind during the season to be merry and bright. There are dangers of decorating your home and safety should not be overlooked. Some dangers include Christmas tree and candle fires, poisonous plants, falls, and back strains. There were approximately 15,000 injuries related to holiday decorating according to the US Consumer Product Safety Commission. The most frequent holiday decorating incidents involved falls, lacerations, burns, and back strains. So, the staff at Wenzel Select Properties put together a list of safety tips for decorating your home during the holidays. Thousands of deaths are caused by fires every year. 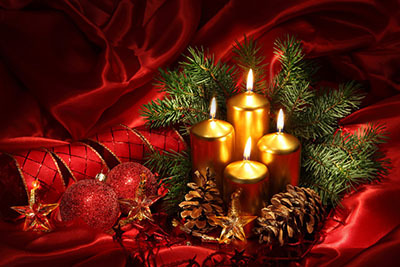 In fact, 12% of home candle fires occur in December, according to the National Fire Protection Association. Make sure your Christmas candles are on stable surfaces, and never leave burning candles unattended. One of the most exciting things about Christmas is decorating your home with beautiful lights! As thrilling and joyful as it is, your safety must be a priority. When hanging your Christmas lights, make sure you use a proper ladder with someone supporting the base. Double check the lights for frayed wires or cracks and make sure there is a bulb in each socket. Discard and replace damaged strands. Leaving Christmas lights on while you’re asleep or leaving lights unattended could result in an electrical fire. Consider using a timer or turn off lights before going to bed or leaving the house. Live Christmas trees are highly flammable and could challenge your safety. Be sure to place your Christmas tree away from any heat sources, including heaters and fireplaces. Sparks from the fireplace can ignite a dry Christmas tree. Do not burn wrapping paper in your fireplace. Wrapping paper can ignite suddenly and burn intensely. Remember to keep live Christmas trees and presents away from the fireplace. They too can ignite from a spark from your fireplace. Plants can spruce up your holiday decorating but keep those that may be poisonous (including some Poinsettias) out of reach of children or pets. The staff at Wenzel Select Properties wishes you a Merry Christmas and a Happy New Year. May the magic of the holiday season be filled with love, health, and happiness and stay with you throughout the coming year.